I normally post personal personal updates on my other blog, but I felt that since people responded to Thief on this blog, I would put this message here. I wanted to say a big thank you to everyone who read, liked, or commented on Thief. You were all such amazing support during this ordeal. It’s an ongoing struggle not to let it affect me, especially with constant reminders of the incident surrounding me. But your supportive comments and encouragement have helped me stay positive. So here’s a heartfelt thank you to all of you! I am so grateful. Your concern, your care, your support. All are the wind that push away the clouds and allow the sun to shine through. You find your regrets as they trickle down the bottle, the last drops at the bottom of your search for relief. The clink of glass as it hits the table was supposed to mean bliss. But instead it’s the thunderous clap of unwanted memories exploding in your mind. Fireworks with colours that fade into bitter, black smoke, lingering in the stagnation of your thoughts. Perhaps, you think as you open another, it will only take one more. And as the air hisses free and the foam spills, you hope your thoughts will do the same. Forever away. It’s there when you finally stop to rest and close your eyes. Gentle against your skin, ruffling your clothes in a springtime dance. It comes with rain and sun and at the dead of night. It secrets through the cracks in the doors, through the screens and stubborn windows. For the most part, it goes unnoticed. But it never leaves, not really. It calms, very often, and as such is mistaken as gone. It takes only a small moment, though, to feel it again. Even within a still room, it lifts the dust from the shelves and into the streaming light, floating the small flecks from one end to the other and back again, restless, waiting for someone to enter. And when you do it swirls with such enthusiasm that you cough. So you open the windows, allowing it to run as it pleases. And at that moment you appreciate even more the way it sweeps past you and through the room, cleansing, purifying. And so you savour every breath you take. The sun shines brightly, peering around clouds. She can feel it warming her skin, yet she feels goosebumps rising. Trying to fight off the cold, she crosses her arms tightly and hunches her back. It’s the middle of summer, but still she trembles. She steps out into the summer heat, and her heart shivers. It echoes to her extremities. Her friends look at her oddly, so she pastes on a dismissive smile. She waves cheerfully, still unable erase the cold arms that surround her. The frigid hand of death that reaches not for her soul, but for her heart. It is not there to take her life. It is satisfied with that which it has recently taken. That of someone close to her. Close enough that it gained a soul, and the mourning heart of another. Now she is halfway to death. A doll, with a permanent smile and eyes that shutter closed the moment people look away. Now she is frozen, unable to move on from her loved one’s death. Instead she remained trapped within death’s comforting embrace. For death understood the pain she was feeling. Death knew her devastation, her loss. Death was there to freeze together the shattered pieces of her heart. Death courted her, and obtained her heart. She would be sitting there every day in the morning when he walked past, glaring, as if daring him to allow his dog onto her lawn. During the summer she would be outside on the porch, in an elongated hanging swing covered in dark, faded blankets that flopped tiredly over the back. When it was colder, she would be inside in the recliner, facing the street with a critical eye. He was always tempted to take his dog off the leash – just to see what she would do. Would she swing the broom he could see tucked away in the corner of the porch? Would she sputter down the stairs and spew angry words from her pinched face? But he never did. Instead he would smile and nod his head in greeting, then continue on to the nearby park. His eyes would linger on the drooping grass and overgrown weeds, but he never paused. Every day her face would remain the same. She would sit there, unmoving except for her narrowed eyes. Perhaps, he mused, her face had frozen in such an expression, and she was incapable of changing it. But he was disproved of this notion when on one rainy morning he smiled and nodded, and for a moment her brows relaxed, the lines around her mouth seemed to lessen, and her head seemed to jerk slightly, a stiff motion, as if she hadn’t oiled her joints in many years. Her eyes seemed to glitter, and he could not figure out why today out of all days they made his heart heavy. The next day she was gone. He stopped in front of her house. The porch was empty, and so was the window inside. He waited for a few minutes, but she never appeared. So he walked on. He did the same the day after, and the day after that, but she never reappeared. And yet he couldn’t help but smile and nod with distant eyes whenever he walked passed, not once letting his dog off the leash. The grass continued to grow and the weeds began eating at the pavement. My muscles strain as I force myself over another large boulder. I grasp the root ahead of me for balance. I can feel my legs burning, my lungs on fire. Still I push on, eyes fixed in front of me. Only the sound of my own harsh breathing reaches my ears. My old record is taunting me, laughing at each pained step I take. I nearly growl as I urge myself to go faster. I can rest when I reach the top. Five minutes and I’ll be there. I manage to pass a fellow hiker. Then someone passes me. I can see the light between the trees, a beacon of accomplishment. Almost there. One more minute. One last turn. 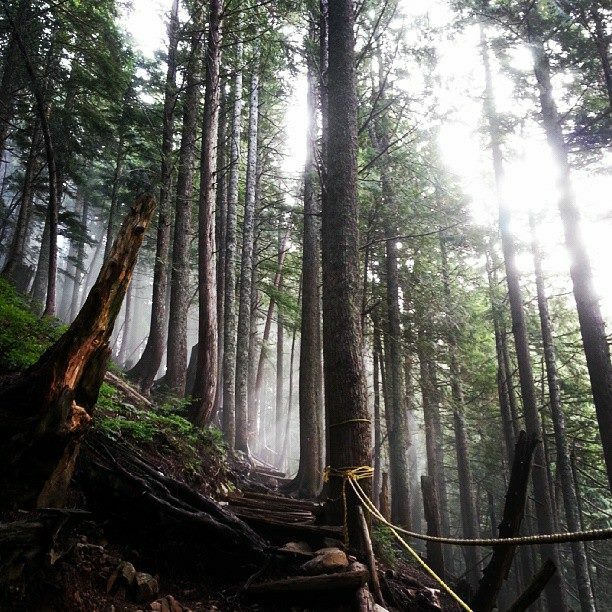 I see a man standing at the side of the trail, stance relaxed, waiting, perhaps stopping to catch his breath. He glances at me and smiles. “why rush,” He replies. “It is good to just be here.” A thick Italian accent lilts his words. My steps falter, and my eyes stray sideways. Vivid greens and browns greet my eyes, and the freshness of the mountain air pervades my nose. Don’t we sometimes get so caught up in what we’re doing that we forget the beauty around us? Competition and goals are important, but so is enjoying yourself. To try and find joy in whatever you are doing. I think ajummas can be some of the most caring people ever. There are exceptions, of course, but the ones I have met have been so nice. The janitor of the building at which I work is a real sweetheart. She doesn’t speak any English, but always says hi and starts a conversation with me in Korean. I’m quite sure I’ve told her some really strange answers (she often laughs when I answer…), but I do my best to follow her questions. She also always expresses concern when my collarbone and neck are exposed to the cold air. It’s adorable. The school cook is another sweet lady. Her food is not as good as the previous cook, but she’s still really nice, so I always compliment her cooking anyway. She always praises my outfits, and also worries that I’ll be too cold if I’m not wearing a thick sweater in the winter. She also sometimes gives me leftovers if she can tell that I enjoyed the food. That’s a major bonus. My friend’s mom bought me flowers the first time we met, and took us for really good 삼겹살. My friend often receives vast amounts of kimchi from her friends’ moms. Honestly, some of the most caring people I’ve met. Like when you’re staring up trying to see the TV monitor to read what station is next, and someone’s head is blocking the way. You end up staring upwards, hoping he’ll move, since it’s too loud to hear the announcement. Then he looks at you and thinks you’re staring at him. And you still don’t know what station is next. In Korea, everything is ‘빨리 빨리’, or ‘quick, quick’. Always moving, always fast, always working. Like any big city, people rush around at all times. It makes things lively, and it makes the city feel alive. Especially when there are so many people. It also means that as the average walking speed increases, so does the chance of bumping into someone, or knocking shoulders. As a Canadian, it’s very normal for me to say ‘sorry’ when I bump into someone, or when they bump into me. Things are a little bit different here. People are still very polite in Seoul. If we are waiting for the subway, or just standing around, people take the time to apologize. But when we are rushing down the street in opposite directions, that’s a whole other story. And understandably so. If they don’t say sorry, there’s no point in getting angry. By the time you turn around with a scolding on your lips, they’ve already disappeared halfway down the road, among a crowd of rushing, bobbing heads. So really, might as well save yourself the trouble, and just keep walking. Chances are they didn’t intentionally hit you, nor did they body-check you across the sidewalk, so there’s no need to release the kracken. I think of it as reflex training. Quicken your reaction speed and improve your spatial awareness. In case I get into that life-threatening street fight for which everyone must be prepared. Who knows when someone might draw a gun and – oh wait, wrong country. 新年快乐！Or Happy Lunar New Year! This is what happens when I spend the new year alone. I have no family in Korea, so I’m spending the Lunar New Year alone. I didn’t really have any culture shock when I moved to Korea. I think. It’s a very different place from Canada, obviously, and it’s very unique. I’ve used squatting toilets before (I’ve even used holes in the floor), I’ve used full-bathroom showers before, I knew I wouldn’t have an oven, and I’ve heard lots about plastic surgery from my Korean students in Canada. I’ve heard people complain that Korean people are rude, but I don’t really find that to be the case. I’d say they’re more brutally honest. If someone bumps into me and doesn’t care, they won’t say anything. Most of them don’t do that, of course, and are quite polite. In fact, if you go into a store, or accept something from somebody, you normally use two hands, and often accompany the action with a bow. If that’s not formal and polite, I don’t know what is. And then there are drinking formalities… but maybe for another time. What does frustrate me is that there is no order on the escalator or stairs. People walk all over the place, and stand all over the place too. There’s no such thing as standing on the right of an escalator, and walking on the left. I often end up just taking the stairs because it’s too annoying. I get more exercise this way though, so I guess it’s not too bad. People do tend to stare here, especially ajussis and ajummas, but I get stared at all the time in Europe too, so I wouldn’t say that’s anything unusual. Ajummas are all-powerful here. You listen to them, and obey them. They’ll shove you out of the way to get that seat, or to get on first. Luckily I was told about this beforehand, so I knew what to expect. I’m quite sure this has to do with respecting your elders, which is a very important part of Korean culture. I’m not sure if it’s because I have traveled before or because I’ve known many Korean people, but while I noticed many things that were very different, nothing really came as a shock. Either that or I’m still numb and it hasn’t sunk in yet.